Miami Herald columnist Leonard Pitts Jr. challenges the GOP perception of black people as lazy and living off the dole by telling his own story of growing up and working as a janitor at a church at the age of 12. The rhetoric is nothing more than "a coded appeal to racist sensitivities," he writes. I got my first job when I was 12. The deacons at my church paid me $2 a week to keep it swept and mopped. 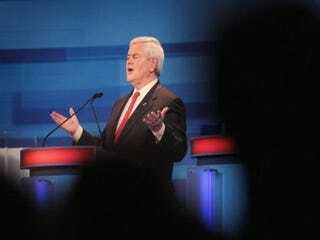 So I do not need Newt Gingrich to lecture me about a good work ethic. In this, I suspect I speak for the vast majority of 39 million African Americans. There has been a lot of talk about whether Gingrich’s recent language, including his performance at last week’s South Carolina debate and his earlier declaration that Barack Obama has been America’s best “food-stamp president,” amounts to a coded appeal to racist sensitivities. The answer is simple: yes. In this, Gingrich joins a line of Republicans stretching back at least to Richard Nixon. From that president’s trumpeting of “law and order” (i.e., “I will get these black demonstrators off the streets.”) to Ronald Reagan’s denunciation of “welfare queens” (i.e., “I will stop these lazy black women from living high on your tax dollars.”) to George H.W. Bush’s use of Willie Horton (i.e., “Elect me or this scary black man will get you..”) the GOP long ago mastered the craft of using nonracial language to say racial things. So Gingrich is working from a well-thumbed playbook when he hectors blacks about their work ethic and says they should demand paychecks and not be “satisfied” with food stamps” As if most blacks had ever done anything else. As if an unemployment rate that for some mysterious reason runs twice the national average does not make paychecks hard to come by. As if blacks were the only, or even the majority of, food stamp recipients. Read Leonard Pitts Jr.'s entire column at the Miami Herald.